Earthscape: Video management made easy. Traditional video hosting sites are great if you have a video that you want to share with others and nothing more. But, what if you care about the information contained in the recording itself — maybe you would like to be able to see where the camera was located, or where it was looking, or what the altitude was, or even the engine RPM? What if you wanted to see all videos where Mike was the TFO, in the month of September, when he was viewing IR imagery? With Earthscape you can unlock the power of your video metadata like never before. Earthscape is a cloud-based video management tool that gives you powerful control over your video and its metadata. Upload, review, and manage tags, clipmarks, and footprints for any video you capture. Know the last time an area was inspected, see all videos that took place in a certain area during a certain time span, find videos with key search terms, and much more. 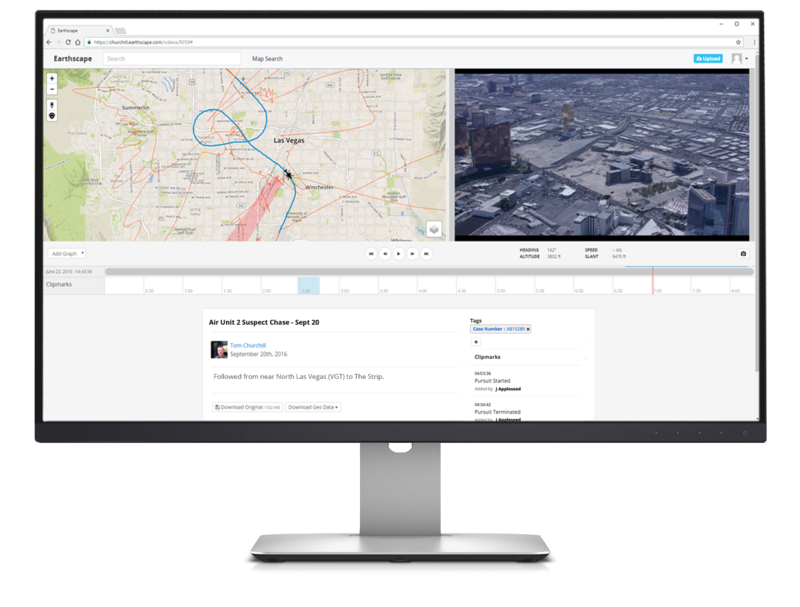 Earthscape puts video geospatial metadata at your fingertips. Earthscape now seamlessly integrates with technology that allows video to be live-streamed from the aircraft over a cellular data connection. The video stream can be accessed by anyone that has been granted security access. Earthscape will even send a notification when a live stream is available, so you’ll know when to tune in for the video. Videos that have been live-streamed can be replayed at any time using Earthscape and recordings can be shared and made accessible to anyone that you give viewing rights to. Earthscape gives the accessibility and insight into your video data that is missing in traditional video hosting services. Get the most out of every video you capture. Earthscape allows you to upload, index, and access your videos and the data they contain like never before. Tags – See something on video and want to be able to go back to it later? Tag the clip with a keyword. Search – Search tags to find every video involving a gun, or every time a certain address or area was captured on video. Timeline – Precisely control playback using a zoomable timeline and drill-down to the exact second an event occurs. Clip marks – Highlight segments of video so that key events can be easily found and replayed. Storage – Secure, CJIS-compliant cloud-based storage means that you can upload and access your video database from anywhere. Purpose-built to make video management easier. Create custom shapes on the screen to highlight hot spots of activity you want to track. Pinpoint areas of critical infrastructure to ensure adequate monitoring for change detection. Narrow down reporting by target type and date range and view the number of flights with video coverage and time spent on target. Click the video above to see a demonstration of some of Earthscape’s features. At Churchill Navigation, we take our relationship with every customer very seriously. That’s why we offer unrivaled customer service and support. We know that your mission demands your full attention so why worry about software updates or support contracts? Never pay for support or product updates again. Want to know more about Earthscape?